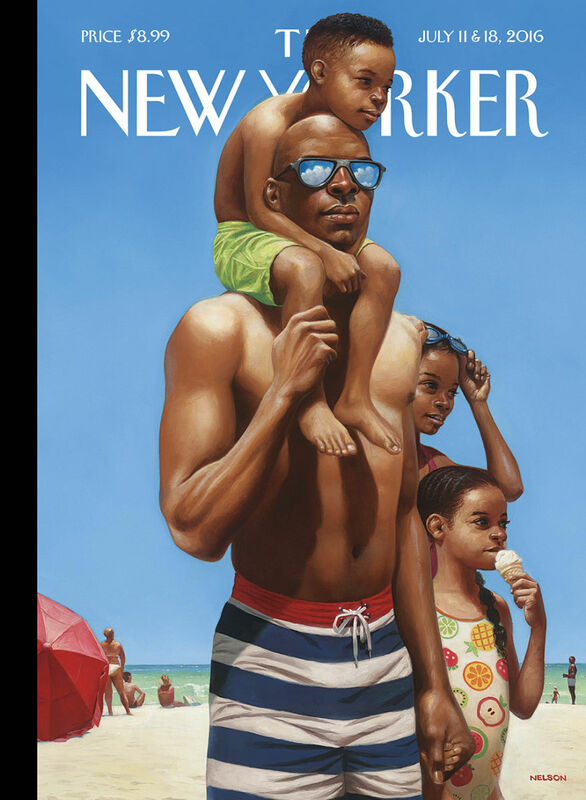 This image is the cover of this week’s New Yorker Magazine — by artist and children’s book creator Kadir Nelson. It’s almost unbearably ironic that this issue comes out during a week of highly publicized, video-recorded, social-media plastered images of black men killed by the police with apparently little or no justifications and five policemen gunned down by an irate sniper at a peaceful rally for racial equality. I saw this image posted by friends on facebook and read some of the comments beneath this picture and found out how differently this picture could be interpreted by different viewers. Someone thought that the father in the picture feels desolation and is not having a fun day at the beach; while others see this as family and harmony. Someone questioned why there are clouds reflected in the sunglasses, and I immediately thought that the comment maker was criticizing the image. This showed how I presumed and assumed others’ intents and how I definitely need to change the way I post on social media to build understanding and not alienation. The comment maker wrote back to say that there might be a “hidden message” in those reflections and I can see that now — and have started to wonder, what do those clouds reflected in his sunglasses mean? So many possible interpretations. I have a few thoughts in mind — what are yours? Kadir’s comment on his cover does not reference any hidden meaning of the clouds. Sunny days at the beach can still have clouds and that is what would be reflected in his sun glasses. I guess I would like to take his comments on his cover at face value – the nice memories that he has from childhood. I loved this cover, and also had a few thoughts about it. I tend to notice things and not try to pigeon hole a meaning. First, I love that the post July 4th cover had this beautiful African American family on the cover. I noticed Red White and Blue shorts on the strong, healthy Dad. I noticed the clouds in the glasses on the clear day, and also noticed he was looking in a different direction than the smiling/content children. This made me feel that is the role of parents — to keep an eye on different and potential situations than where children are in the present. I also felt that these children are in a perfect spot — with their Dad, with ice cream, on the beach – just where I want all children to be. I noticed they are each absorbing the day in beautiful, distinct ways. I also noticed the beach was pristine clean. I considered that I think there were only African American people (different ages) on the beach. Everyone seemed content to me. I loved the angle as we see the blue sky for more than 4/5th of the cover — and the impact that has on making us closer to the family members. Anyhow — Kadir Nelson’s paintings have often brought me into a scene, and offered complexities about people in a powerful, subtle, and thoughtful way. This cover was no exception. I also began to think about how often does one artist do two covers of The New Yorker in a short period of time. A few months ago I recall he painted a beautiful cover that I interpreted as a celebration of the Harlem Renaissance. May you enjoy your summer as much as these kids! Best,Roxanne. My first reaction when I saw our copy of the magazine was, “Oh, how ironic.” Then I thought, “What a gorgeous family. It reminds me of photos of the president with his kids.” There’s no doubt that a feeling of tension comes across in the father’s firmly clenched hand and his strong, protective stance. The children seem relaxed although they are staying close to their father, not dashing ahead, carefree and excited, the way we’d expect kids to be at the beach. The older girl is either pushing up or pulling down her sunglasses and her expression is serene although it’s hard to be sure. The father’s swimsuit is all-American colors and appears deliberately ironic. The clouds must be on the horizon, and although they don’t appear threatening, they are white and could mean trouble for a black family. Why isn’t the mother in the picture? Is she there, waiting for them to return from buying ice-cream? Let’s hope so. And the little guy on his father’s shoulders . . . will he grow up and bring his family to the integrated beach or end up shot or in prison? As the mother of black boys (now men), I love this cover and the fact that it portrays the love they feel for their children. I first thought: just because there are no clouds on the sky behind him, on the sky that the viewers can see, it does not mean that there were no clouds where we cannot view. This seems to me symbolizes how we consider reality/truth — it is hard for everyone to see the whole truth, or to see any situation from the exact same angle and that because of where we each stands, we might interpret reality differently. And how clever it is that Kadir uses the sunglasses to indicate to his viewers that there ARE clouds in the sky, we just can’t see them ourselves – without the help of the reflective sunglasses, and by extension, without the help of the father depicted in this picture. As to Kadir’s signature quiet dignity shown on the faces and through postures of his subject matters — some people might interpret it as insolence, arrogance, or aloofness. Images are funny things — we all bring so much of ourselves into viewing them. I also saw the clouds as a message. Clouds on the horizon: the family’s future, which could be perilous. I imagined dad reflecting on his son’s loving innocence and “the talk” to come…. Then I had a different take. Maybe dad in his red, white, and blue represents America in general, and the clouds reflect a scary scenario whoever you are and whichever way you look. It still feels more warm and serene than scary to me. I didn’t notice the others on the beach, focusing only on the beautiful family. In hot west Texas, where I live, fluffy white clouds are not at all ominous. The artist is from California and recalls times at the beach with his father, and later, with his own children, with joy. In desperate need of good news, this his how I choose to interpret it. Six degrees of separation? or how likely is this: two women who commented previously are friends— one of them decades ago in high school, the other a good friend over the years. And my feelings or impressions are different. Knowing the beaches out on Long Island I felt nothing ominous was depicted on the horizon; rather that the clouds in the sunglasses gave depth to the environment: the beach, the ocean on a summer day a place where families..where all peoples, could feel content and at ease. This is how I have felt all my life about being at the ocean, with my family, with friends or alone. My first thought was whether this handsome painting had been slotted for the magazine’s Father’s Day issue, but some news story bumped it. I was thinking of looking back a couple of weeks to see if the issue before Father’s Day sported some particularly quick and timely comment on the news. As for Kadir’s painting, I find it impossible not to read into the little boy on his shoulders and the clouds reflected in the sunglasses — that he will do everything he can to hold up that little boy as he grows against the clouds/trials to come. As a children’s librarian who has followed Kadir Nelson’s career I was thrilled with the cover image. I am still working my way through the contents, as usually happens, and again this morning I took another look at the cover. I smiled, at the older sister, the younger sister’s hand in her dad’s hand, and the innocence of the young boy on his father’s shoulders. To me it is no other statement than the moment in time, at the beach, with your father on a beautiful summer day, and the memories they children will hold.